Chocolate Ale | Boulevard Brewing Co.
One of the brightest stars in a city filled with culinary treasures, Christopher Elbow has been handcrafting masterpieces in chocolate for more than ten years. In that time the reputation of his artistic delicacies has spread around the globe. Elbow’s sweets are distinguished by their use of unusual and sometimes surprising flavors and ingredients; in that adventurous spirit we joined forces to bring you a very special Chocolate Ale. In developing this beer, Elbow and Boulevard brewmaster Steven Pauwels sought to harmonize the interplay of chocolate and malt, with each supporting and enhancing, but not overwhelming, the other. Just the right chocolate was essential. Elbow recommended a rare variety from the Dominican Republic, prized for its robust flavor and aroma, and a personal favorite. More than a mere flavoring, the chocolate — in the form of nibs, or crushed, roasted beans – was incorporated into the brewing process itself. A- Great cap & cork top to start....nice fog that comes out of the bottle upon opening! The brew itself pours a toffee color with background notes of red and orange...it is partially hazy from yeast and chilling, plus has a solid looking head that is eggshell color. The head is two fingers thick and retains rather well, becoming more pillow like as time goes on. The carbonation appears to be robust and rather aggressive, with lots of big bubbles rising to the top. Lacing is modest at best....very small patchwork of foam clings to the side of the glass. S- There is plenty of grainy sweet malt, hints of caramel/toffee, slight nuttiness, cocoa nibs, vanilla and there is a smooth alcoholic tone throughout on my nostrils....I guess at this alcohol level there should be right? !....not much else going on....perhaps some slight hop bitterness on the finish. T- Ok, this is most interesting.....definitely there is chocolate flavors that are more along the lines of milk chocolate in terms of sweetness. Hints of caramel and nuts, and weirdly enough, I am picking up flavors of weak cherry, apple and apricot. There are moments of alcoholic presence but surprisingly it is rather smooth instead of bold as I was expecting. The finish is clean and with just enough of a lingering presence to remind me that I had a taste of something good! M/O- Smooth character with plenty of velvety carbonation to provide flavor bursts at every moment. The alcohol warms up in the belly rather than on the palate. I find overall that this is rather drinkable and while I probably wouldn't dabble into a second in one sitting, I think the sweet balanced nature of this one can and will catch up with anyone rather quickly. I recommend this one...it's rather nice! 750ml bottle into a pint glass. A: Pours a dark amber color. The head is about two and a half fingers high, and pale yellow in shade. Very fluffy and soft-looking, the retention is quite good. On the other hand, no real lacing is left behind. S: Opening the cork reveals a borderline spectacular bouquet of dark chocolate. Then I pour it into the glass, and I'm left wondering - what happened to the chocolate? In the glass, I'm getting notes of vanilla, banana, roasted nuts, caramel, but minimal chocolate. I'm also getting touches of spicy Belgian yeast. Somewhat disappointing; if this smelled like it did from the bottle as it does now, it would be an easy 4+. T: Some sweet dark chocolate opens it up, along with some caramel and vanilla. There's a genuine white chocolate vibe with the flavor profile. It's even brownie-esque at times. After that, this one stumbles somewhat - some fruity, mildly spicy yeast enters in the middle and finishes it off. The yeast character seems to lack definition (disappointing considering who makes it) and obstructs some of the nice chocolate notes. M: Rather heavy on the palate, and quite sweet. This doesn't have the deceptive drinkability Boulevard's other 750s have. The carbonation is pretty low, as well - put simply, it's a sipper, not a chugger. O: A solid beer in small doses - the chocolate flavor (despite the disappointing aroma) is moderately prevalent, but it's a bit of hard work to imbibe. If this were closer to a stout or even a brown instead of an amber/red, I'd like this much better. This is something that you split between 6 or so people instead of drinking by yourself. Appearance: pours a hazy amber color with a short 1/4" head. Smell: caramel and chocolate are detectable by the nose. Taste: Caramel, chocolate, ripe dark fruits, and a moderate bitterness. Overall: a nice ale that has a decent chocolate flavor but it is not overpowering. Easy to drink. Bottle: Poured an amber color ale with a large light brown foamy head with good retention and some lacing. Aroma of chocolate and nutty malt notes is quite interesting. Taste is also dominated by really nice floral black chocolate notes without much bitterness. Nutty caramel malt notes are also easily discernible and really enjoyable. Body is about average with good carbonation with no apparent alcohol. Very enjoyable and nice integration of chocolates notes without going back to a stout. A: The beer is very hazy amber orange in color. It poured with a quarter finger high off white head that died down a bit, leaving a thin layer of bubbles on the surface and a collar around the edge of the glass. S: Light aromas of chunky yeast (the kind of yeast you taste at the bottom of a large bottle) are present in the nose. T: Unlike the smell, the taste has flavors of cocoa nibs. M: It feels medium-bodied but a little thin on the palate with a moderate amount of carbonation. O: Considering its strength, this beer isn't that difficult to drink because it hides its alcohol very well from the taste. A: It's an interesting beer right off the bat. The body of the beer is a very hazy orange light brown color, with a fairly light eggshell white head.It has an enormous amount of carbonation, and I want to emphasize the importance of a careful pour with this one. The head is ridiculously huge. I had a bit of a gusher, but I eventually got it settled down. Aside from the foam fountain, the beer really is fantastic looking! T: Very uneventful in the taste department. I get some alcohol and a tad of caramel. Where is this mythological chocolate that the label claims?! For shame! M: Admittedly it is hard to focus on something as simple as the mouthfeel when I am cheated at taste. It's fine. I'll rate it "okay" because I am quick to move on with this beer. Adjust your expectations accordingly. O: No chocolate. That should be enough to deter any drinker with the literary aptitude to read a bottle. I can't say in good conscience that it is a horrible beer, but it is quite poor. I feel that my expectations have been ransacked; that I've been bamboozled! How could a beer boast the proclamation of chocolate and stand with nothing to offer? For those who live in the world of summation and "buzz-words," where is the chocolate??? On tap at the 2014 Secret Stash Bash (Atlanta). Pours clear dark amber. Very good head. Nose is mainly rousted chocolate nibs. Chocolate really comes out in this ale.\: Ii's actually the main flavor component. Still, not as tasty as fine chocolate on its own, but an impressive brewing achievement. Medium light body medium carbonation. Always like this in the bottle, probably more than most. But had it on tap last night and I now consider one of my favorites. Absolutely stunning. Cocoa nose. Dark chocolate palate. Light color. Long finish. Medium heavy body. Sorry. This didn't work for me. I must say that the flavor IS chocolatey, but not a pleasant type of chocolate - unless you are into very dark, bitter chocolate flavors. I'm not. And I rated my experience as best I could based on my aversion to very bitter chocolate flavor. However, anyone actually reading this shouldn't take my word for it. If you like bitter, and you like dark bitter chocolate, you may love this brew. It's just not my thing. I was disappointed by this offering from Boulevard, which I was really looking forward to trying. I just didn't taste the chocolate as much as I should have. Reviews were pretty hit or miss, and I knew that before I bought it, but was hoping it would be more of a hit for me. Oh well. I'll try another Smokestack Series release eventually since most of the rest of them appear to have been more successful. 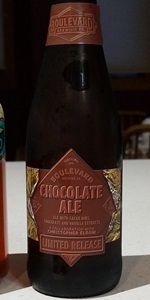 Chocolate Ale from Boulevard Brewing Co.